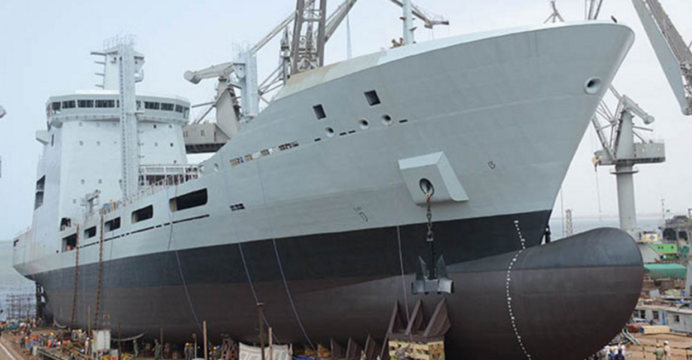 The STM Pakistan Navy Fleet Tanker during the construction phase. In a hearing on July 26 with Pakistan’s state-owned defence industry firms, the Pakistani Senate’s Standing Committee on Defence Production recommended expediting the development of the Gwadar Shipyard. According to the state-owned Associated Press of Pakistan (APP), Karachi Shipyard & Engineering Works (KSEW) had briefed the Committee on the progress of the program, stating that it had been moved to the Prime Minister and Planning Commission for approval. Concerned that the program has been delayed, the Committee called for the process to be expedited. Abdul Qayyum had noted that there were “concerns” regarding the stewards of the program, which is the Ministry of Defence Production (MoDP). Some recommended that the Gwadar Shipyard be placed under the mandate of the Ministry of Ports and Shipping. The Committee was also told that a Chinese partner was willing to invest in the Gwadar Shipyard program. Currently, the entirety of Pakistan’s maritime development activities is undertaken by KSEW, which itself is scheduled to undergo infrastructure expansion and modernization. The MoDP’s 2015-2016 annual yearbook outlined that KSEW will manage the construction of the Pakistan Navy’s next-generation submarines, corvettes and submarine rescue and salvage vessel. KSEW will also undertake a new miniature submarine program and, should it come to fruition, new fast attack craft (FAC) for the Pakistan Navy. Even with capacity expansion, it seems that KSEW will retain its primary focus of serving defence requirements, which could then leave an opportunity for private or joint public-private ventures to utilize Pakistan’s civil and commercial shipbuilding potential. The Gwadar Shipyard appears to be an attempt at the latter (i.e. commercial shipbuilding), especially as a Chinese investor is reportedly willing to engage in the program. While infrastructure development is one aspect, Gwadar Shipyard’s long-term potential is contingent on sustainable domestic and foreign orders. If the Gwadar deep-sea port succeeds in generating activity, that should propel Gwadar Shipyard to build barges, survey vessels, tugs and floating docks to support the port’s activities. Growth in Pakistan’s trading sector – i.e. its Merchant Navy – could see the construction of new freighters. However, despite the potential growth – and possible need – the Gwadar Shipyard as well as Port Qasim Shipyard initiatives have repeatedly fallen into bureaucratic inertia. According to the Pakistani news outlet the Daily Times (in September 2016), both programs were repeatedly shelved in the Ministry of Ports and Shipping due to new officials pivoting from the priorities of their predecessors. However, statements from the recent hearing with the Senate Standing Committee for Defence Production suggests that the Gwadar Shipyard project is now under the aegis of the MoDP. The original plan (from 2007) for Gwadar Shipyard was to establish it at Gwadar East Bay with the capacity to ultimately construct ships of very large crude carrier and ultra large crude carrier dimensions and mass. Gwadar’s two drydocks were planned to handle up to 600,000 dead weight tonnage.